October 24, 2016 – Saturn’s clouds are full of raw beauty, but they also represent a playground for a branch of physics called fluid dynamics, which seeks to understand the motion of gases and liquids. Saturn’s lack of a solid planetary surface (as on Earth, Mars or Venus) means that its atmosphere is free to flow around the planet essentially without obstruction. This is one factor that generates Saturn’s pattern of alternating belts and zones — one of the main features of its dynamic atmosphere. Winds in the belts blow at speeds different from those in the adjacent zones, leading to the formation of vortices along the boundaries between the two. And vigorous convection occasionally leads to storms and waves. Saturn’s innermost rings are just visible at the bottom and in the upper left corner. This view is centered on clouds at 25 degrees north latitude on Saturn. 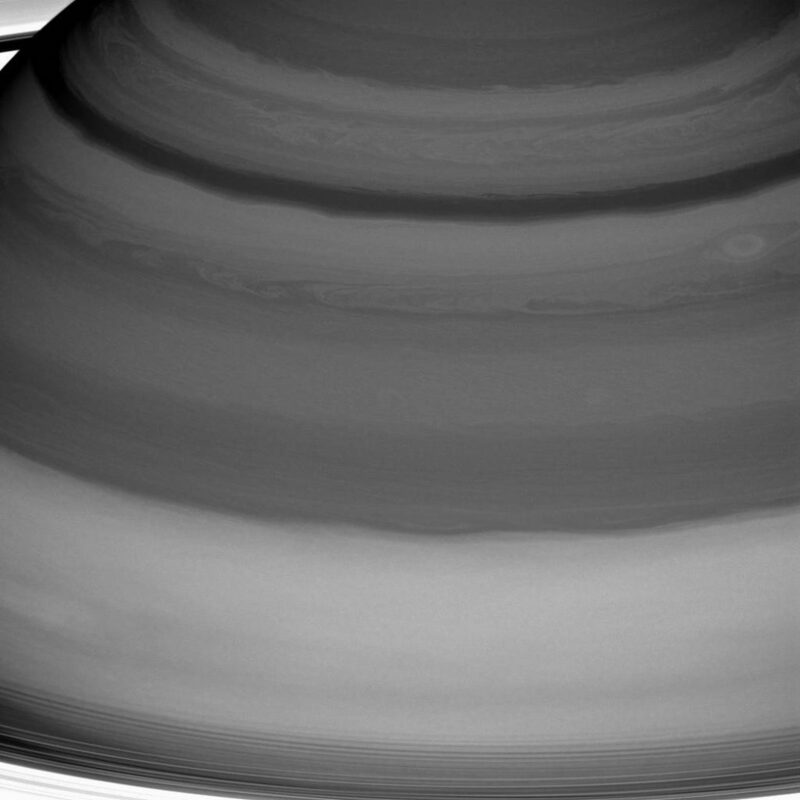 The image was taken with the Cassini spacecraft wide-angle camera on July 20, 2016 using a spectral filter which preferentially admits wavelengths of near-infrared light centered at 728 nanometers. The view was obtained at a distance of approximately 752,000 miles (1.21 million kilometers) from Saturn and at a Sun-Saturn-spacecraft, or phase, angle of 6 degrees. Image scale is 45 miles (72 kilometers) per pixel.